Lofty Heights Conference is an annual inspirational gathering designed to empower participants to be the best in their chosen fields and live a purposeful life that is built on excellence. It is a gathering that helps participants get clarity on goals and visions for the new year, hence, why it holds at the start of each year. This full list of speakers for this year’s edition of the conference has been unveiled, and yeah you don’t want to miss the opportunity to sit under the influence of such great people. 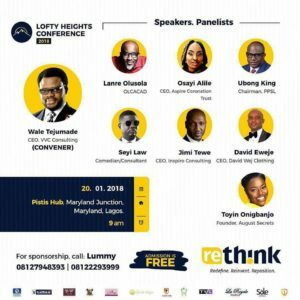 LANRE OLUSOLA, JIMI TEWE, DAVID WEJ, SEYI LAW AND OTHERS TO SPEAK AT LOFTY HEIGHTS CONFERENCE 2018. 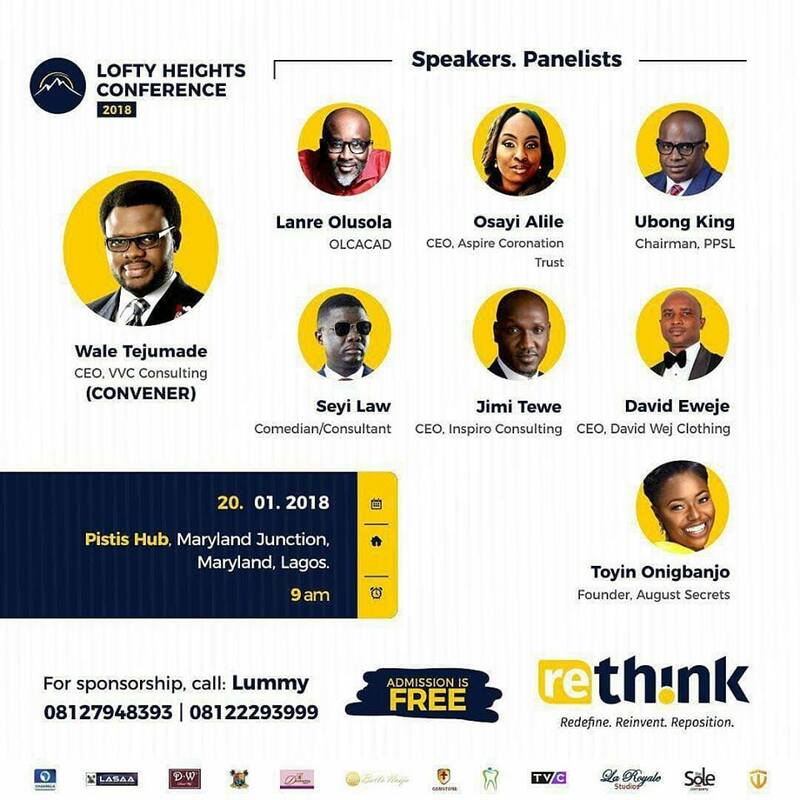 The Lofty Heights Conference boasts of eminent personalities in Nigeria who have graced her platform and thereby welcomed them into her Hall of Fame. Some of these great personalities include Kunle Soriyan, Niyi Adesanya, Morayo Afolabi Brown, Holy Mallam, ID Cabassa, Titi Oyinsan, Glowreeyah Braimah, Fela Durotoye, Ayodeji Megbope, Japheth Omojuwa, Praise Fowowe, Frank Edwards, Akpororo, Opeyemi Jaiyeoba and many more. The last edition which was held at TBS, Onikan, Lagos had in attendance over 1300 participants at the venue and tens of thousands of others via our active Social Media engagements and live streaming. Testimonials still keep pouring from attendees of previous editions. In a communique released earlier this week by the convener of the event, Coach Wale Tejumade, released the line-up of speakers and panellists for the 2018 edition of the conference. One of Africa’s Premier Life, Mind, Emotions and Behavioural Change Coaches who work with individuals and organizations to transition from where they are to where they desire to be, Coach Lanre Olusola, will headline this year’s event. Speaking alongside him will be the CEO of Inspiro Consulting, a Career Services & Human Resource Management firm, Jimi Tewe. Jimi Tewe is a Life Coach with a personal interest in people development; He does this through coaching, inspirational speaking, and mentoring. The empathetic, focused, charismatic, innovative, visionary and creative Group Managing Director and Chief Executive Officer of Protection Plus Services Limited (PPSL), Ubong Thompson King, will also be speaking at #LHC2018. Ace comedian Oluwaseyitan Aletile popular known as Seyi Law, Fashion Designer and founder of the Lifestyle Brand (David Wej) Adedayo David Eweje, Journalist and Head cook at Augustsecret Toyin Onigbanjo, and the CEO ACT Foundation Osayi Alile are the other speakers and panellists scheduled to challenge the participants’ mental prowess and produce extraordinary results with tangible and irrefutable proofs at #LHC2018. Also speaking about the theme for this year’s edition of the conference, Coach Wale Tejumade explained why “RETHINK” is the perfect theme for #LHC2018. 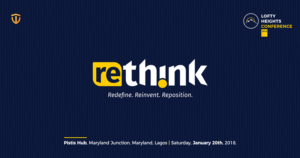 The theme for the year 2018 edition is “Rethink”. We believe an average Nigerian youth is a great thinker and this fact can be seen in the plethora of creativity and entrepreneurship spirit often displayed by them. However, as fantastic as it may be to think, we must also be able to sieve, refine and redefine our thoughts by Rethinking, and in the process, going beyond the limits to achieve extra ordinary results, turning impossibilities to possibilities, shattering every glass ceiling and going beyond the norms and standards! 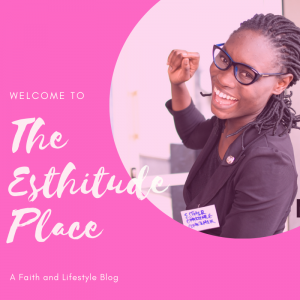 We believe thinking alone is not sufficient to deliver extraordinary results, we must also be able to rethink, revisit abandoned projects, dreams and visions and pursue them with renewed understanding and vigour. 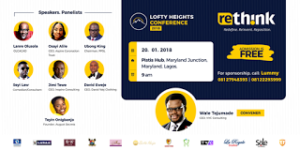 Lofty Heights Conference holds on Saturday 20th January 2018 at the Pistis Hub, Maryland Bus stop, Lagos by 10 am. It is an absolutely free event but compulsory registration via http://lhc2018.eventbrite.com as only limited seats are available. 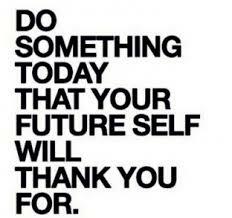 It is time to REthink, REdefine, REinvent and REposition for greater exploits. Thanks for sharing. I’m a fan of Seyi Law! Not in Lagos though. But will definitely inform others. Thanks dear, you are appreciated.